What does a mechanics degree graduate do? An individual who has completed mechanics school fixes, and performs preventative maintenance on a variety of vehicles. Most mechanics school graduates will specialize on a certain type of vehicle: be it a plane, motorcycle, or cars. Most mechanics school programs will require that you choose a specialization, and only focus on one type of vehicle for your schooling, so that is something you will need to consider before applying. What kind of mechanics schooling will I need? You will need to complete a certain number of educational hours in mechanics school before you can become a certified mechanic. Every province and state will have different requirements, so be sure to take some time to look into the mechanics school requirements in your area. What will I need to be accepted into mechanics school? What mechanics courses will I take? The majority of mechanics schools will have a relatively standard set of mechanics courses available, and all will include aspects of on the job training. Will I need anything in addition to my mechanics degree? 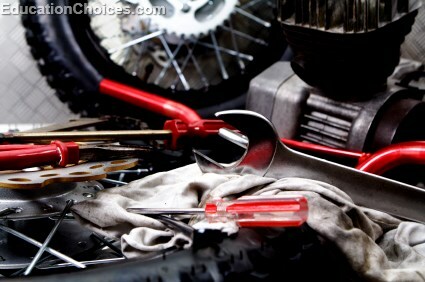 Once you have completed your mechanics degree, you will also be required to become a certified mechanic. This will typically require that you have completed a certain number of hours of on the job training under the supervision of a certified mechanics school graduate. You will also likely need to pass a written test, which will be based off of knowledge you will have learned in your mechanics courses. How much will I earn as a mechanics school graduate? Once you have completed mechanics school, you can expect to earn an average salary of approximately $ 21 per hour. There are a number of factors that will affect your salary as a mechanics school graduate, including: your years of experience, the type of mechanic work you do, the hours you work, your geographic location, and whether or not you are part of a union. What are the job prospects for individuals with their mechanics degree? The job market for individuals with their mechanics school degree is seeing growth. As long as people use machines, and need vehicles (be it trains, planes or automobiles) for transportation, there will be a job market for individuals with a mechanics degree. Also, as cars are starting to have more complicated technology, such as onboard computers, it is getting harder and harder for the average person to fix their car on their own, and therefore they will require the skills of a qualified mechanics school graduate.